Drone technology has experienced drastic traction when it comes to improvement and development of the latest drone models. The newest drone interfaces are now able to sense the aircraft’s surroundings and avoid a collision, their active battery life has increased nearly ten times compared to the first drone models and the flight control experience has been tremendously improved due to better motion sensors. However, apart from all the positive improvements, the true power of development will be unlocked by working on drone interface technology using digital twin simulations. There are a few huge benefits that drones will be able to bring to the table if they are improved correctly and in this article, we will talk about the most important and exciting features that will make it happen. The biggest factor that hinders the use of drones is their total lifespan or the total amount of time they are able to be in the air. Although tremendous progress has been made when it comes to drone battery life, their ability to withstand long time periods being mobile in the air is still limited, however, digital twin technology can prolong it. This will be possible to do by digitally connecting the physical twin (the physical drone) with its digital twin (a replica of the drone that is based in a simulation environment) and this will allow the real drone to be controlled in real life, via the digital twin online platform. By connecting the two twins together, the physical counterpart will be able to increase and prolong its energy spend by being charged via the digital dashboard. The second biggest issue that surveillance or inspection drones experience is the limited ability to produce the visuals in front of them during extreme distances. When it comes to the visual equipment most professional drones have, there is still a lot to explain. This is why we are hosting an event to dive deep into this – join our digital twin drone event to find out more. 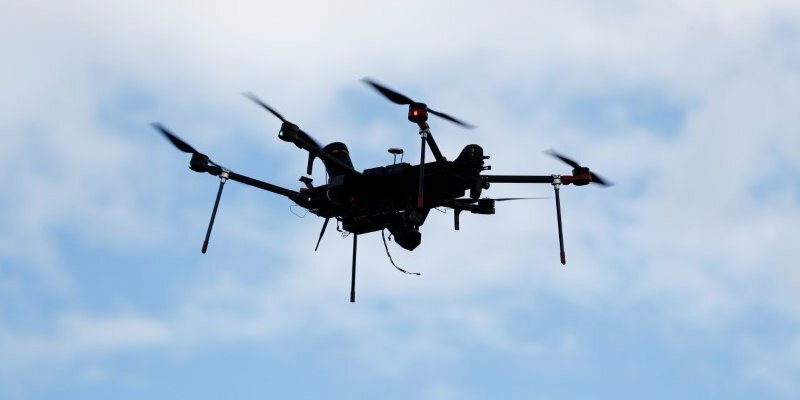 they are able to produce 720p or even 1080p HD live video quality, but the network connection that the technology relies on to produce real-time visuals get cut off if the drone exceeds the optimal distance it needs to operate in to clearly see what the cameras render. Digital twin technology is able to create future or real-time simulations that register the environment a drone is in, including the terrain, near obstacles, moving missiles and even weather. This information gets fed into the digital twin dashboard directly, allowing the person who is in charge of controlling the drone have better visuals. In order to keep improving the crucial elements of a drone that directly impact its performance (e.g. battery life, equipment durability, software lifespan, immunity to hacking etc.) developers need a method to keep performing tests and development operations to have a cost-efficient way of improving the digital interface and physical body parts of drones. The digital twin platform and simulations will be the bridging gap between these two things as the cost for conducting tests on a digital interface does not have any ongoing costs, apart from the main expense of gathering equipment that is needed to use digital twin technology. Eager to find out more about all of the capabilities of this technology on drones and gain insider insights on how the big players in the industry are using it to gain an advantage? Check out our event by clicking the button above. Learn how we utilize digital twin technology in the healthcare sector. Enhancing the human body with virtual twin simulations.